Hyaluronic Acid Cream uses a potent blend of vitamins and Certified Organic Botanical Extracts to battle the aging process. Hyaluronic Acid restores skin’s natural moisture and helps to reduce the appearance of fine lines and wrinkles. Enrich your skin with an antioxidant defense against environmental damage and promote skin’s firmness for a healthy, youthful appearance. Pro Stem Cells Serum is an advanced formulation that utilizes the power of Apple Stem Cells to repair skin from environmental and UV damage. Breathe life into your skin as Apple Stem Cells and Squalane work together to promote cell production, enhancing skin’s appearance and longevity. Pro Stem Serum revolutionizes skin repair, leaving you with younger-looking skin by reducing the key signs of aging. 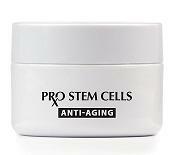 Pro Stem Cells is a revitalizing and nourishing eye cream that is infused with Apple Stem Cells to effectively help reduce crow’s feet wrinkles. Quickly absorbs to help deliver anti-aging benefits and diminish dark spots. A gentle blend of organic extracts and vitamins help improve moisture and circulation for smooth, healthy-looking skin. This moisturizing and nourishing neck cream easily absorbs to help promote firm, healthy skin. It’s formulated with advanced Apple Stem Cells to tone, tighten, and renew cells in the neck area. Organic extracts, vitamins, and essential oils work together to help reduce sagging neck skin and the appearance of fine lines and wrinkles.